Few topics can become more heated than politics, but our wide array of gifts for both Democrats and Republicans will diffuse any situation with laughter. Political ribbing has been around since folks made fun of Washington’s wig, and now you can join in the fun with these hilarious products. It doesn’t matter if you love or hate the President, we have a selection of gags and gifts that will satisfy your need for political satire. Politicians have always been full of crap, but now you can turn the tables with Trump Toilet Paper. 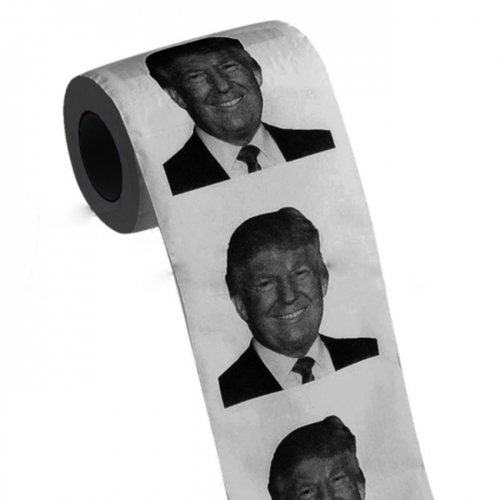 Each sheet has the visage of “The Donald” and will clean your bottom despite the things that have come out of his mouth. We suggest using this special paper after a particularly jarring taco Tuesday or a few too many spicy jalapenos. Trump is known for his fiery rhetoric, and you’re known for your fiery backside. It’s a perfect combination. It’s a great gift for Republican, Democrat or other party member. Don’t let “The Donald” get off scot free this election cycle. Even if he doesn’t win the presidency, he can still feature prominently in your bathroom agenda. You’ve supported him, and now it’s time for him to support you. One good wipe deserves another. Let’s make your bottom great again. Who would love Trump Toilet Paper? Are you a supporter who isn’t agreeing with his new toned down approaches? Are you a Democrat who can’t believe he’s reached this far? Donald can reach wherever needed to get the job done, so you’ll love Trump Toilet Paper. People may need to build a wall around your bathroom after a big dinner, and Donald Trump is there for you. Can it handle a night of beans and dairy? So, you went all out on that triple refried bean burrito and washed it down with a large chocolate shake? While most toilet papers would cower in fear, Trump Toilet Paper is up for the challenge. He’s trying to make America great again, beginning with your bowels. Wipe with confidence. Does “The Donald” use it? Sadly, “The Donald” primarily uses $50 bills to polish his backside, but if he was like the rest of us, then he’d definitely use it. The great thing about Donald Trump toilet paper is it puts you on equal footing with the man who would be POTUS. Stock up now, because people will be dying to use this as the election goes on.